When a young baby was left at the entrance to an orphanage there was no clue as to where she came from; unless you consider that there was snow on her blanket and yet there was no snow in the area. As Tess grows up she becomes fascinated by science and is allowed to have a small lab at the orphanage (Ackerbee’s), life is fairly good. Then suddenly she is whisked away by a stranger purporting to be her guardian and life begins to be less certain.Tess is accompanied by her pet tarantula Violet and by a device that was found with her as a baby; it has strange star shaped inscriptions, but what is it for? Tessa finds out when the device allows her to communicate with a boy in a parallel world and they discover a conspiracy to take over one of the worlds. How can they prevent the destruction of a peaceful world and what is the relationship between Tessa and Thomas? This is a magical tale of two versions of our world and how the misuse of scientific knowledge can lead to danger and destruction. The story itself is about friendship, family in its broadest sense and how science can be used for both good and bad. The author has created these two parallel worlds, both of which see the action taking place in their version of Dublin. There is a real sense that we know these worlds, yet they are just different enough to make us wonder about alternative possibilities.The characters are well formed and there are some great villains in the form of Norton Cleat and the housekeeper Mrs Thistleton, so that you really long for them to get their comeuppance. 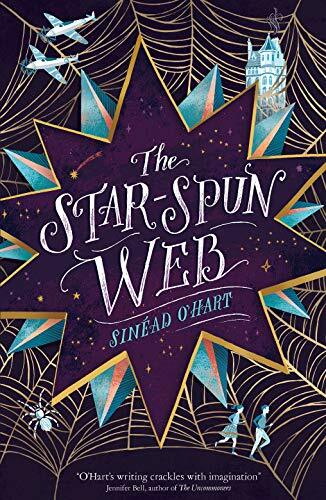 It is really good to see an orphanage that is shown in a positive light, rather than being the stuff of nightmares.This is Sinead O’Hart’s second children’s story and she has produced something that is even better than the first. This is an absolute gem and hopefully will become a firm favourite for lovers of the fantastic.